Crowdsource the place YOU want – right now! While this site provides you 1400 vignettes on what crowdsource placemaking can create, it doesn’t provide you with the direct means to actually crowdsource these places. That’s no longer the case. Join the CoolTown Network (see new green button in the right column) and create a new Group to start crowdsourcing the kind of place you’d like to see in your city or neighborhood. Is it a coffeehouse? A coworking site? Attainably-priced lofts? You define the vision, then start attracting people to build up a crowd. What’s next? Once you build up a following of at least a hundred people also committed to implementing that shared vision; a beta community, we’ll help you find a ‘Sponsor‘, that is, an entrepreneur willing to invest in your group to implement your collective vision. We’ll call it the CoolTown Crowdsourced Placemaking Challenge. If you need technical support in helping you grow your beta community, you can subscribe to such a service – go to the CoolTown Beta Communities home page and scroll down. 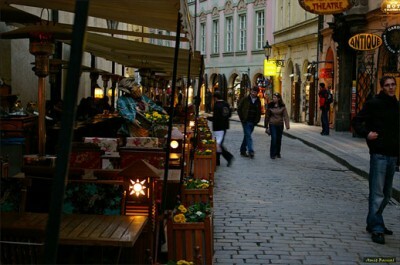 Image: Street in Prague, Czech Republic by ZeHawk.